Coding sequence for Nuclease from Staphylococcus Aureus, regulated by T7-promoter. This enzyme has the ability to cleave DNA. Nuclease is an enzyme with the capability of cleaving phosphodiester bonds between nucleotides in DNA. This enzyme can be used in applications concerning degradation of DNA. In our project the aim was to evaluate and use Nuclease degrading abilities to inhibit the biofilm formation produced by Staphylococcus aureus. The encoding part of the BioBrick is derived from BBa_K729004, made by iGEM London 2012. The T7 promoter (BBa_k525998) has been inserted to control protein expression under IPTG induction. To regulate the protein expression under T7 promoter control, E.coli containing a T7 polymerase must be used, for instance BL21(DE3). There are several bacterial pathogens using Nuclease to combat the immune response in the host by for instance avoiding neutrophil extracellular traps (NETs) . Furthermore, since eDNA is an important component of biofilm, Nuc is able to work as a regulator of biofilm formation . Studies have suggested that the expression of Nuc contributes to the inability to produce biofilm and during biofilm formation-conditions the expression of Nuc is repressed. This BioBrick has been characterized by Stockholm iGEM Team 2016. Nuclease was 3A-assembled with a T7-promotor using appropriate restriction enzymes. The ligation product was transformed into TOP10 cells, and plasmids were extracted and transformed into BL21(DE3) cells for expression. These results were confirmed with a single digestion analysis. The sample in well 5, Figure 1, had the expected size and this sample was therefore used in subsequent the experiments. Figure 1. 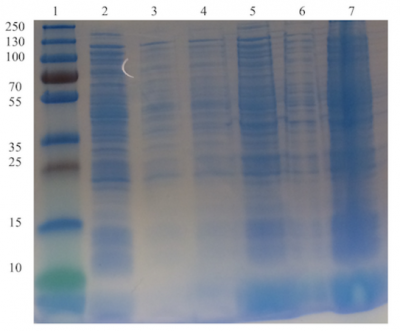 Gel electrophoresis shows bands of Nuc with the expected size ~ 2700 bp. (1) DNA ladder (3) Nuc from BL21(DE3) (4) Nuc from BL21(DE3) (5) Nuc from BL21(DE3) (6) Nuc from TOP10 (7) Nuc from TOP10 (8) Nuc from TOP10 (9) DNA Ladder. Liquid cultures of Nuc were induced with IPTG to initiate expression, and the samples were then centrifuged. An SDS-PAGE was run to determine the presence of expressed protein in both the pellet and the supernatant. 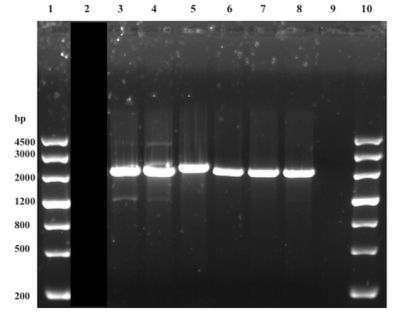 Well 2 in Figure 2 showed visible bands that corresponded to the expected size of nuclease, indicating that the plasmid of interest was functional and expressed when inducing with IPTG. Well 3 and 4, however, did not correspond to the expected size. This may be due to lower IPTG concentrations on those samples. Figure 2. Results of the SDS-PAGE run at 200 V, Expected size: 20.7 kDA. (1) Protein ladder (2) Nuc 1.0 mM supernatant (3) Nuc 0.5 mM supernatant (4) Nuc 0.5 mM supernatant (5) Nuc 1.0 mM pellet (6) Nuc 0.5 mM pellet (7) Nuc 0 mM pellet. Figure 3 illustrates how Nuc (the samples were a combination of pellet and supernatant with the ratio1:1) dispersed biofilm produced by S. aureus. There was a significant difference between the negative control and each of the three volumes of Nuc (p<0.05 for all using student’s t-test). As the volume of Nuc increased, the absorbance at 595nm decreased. 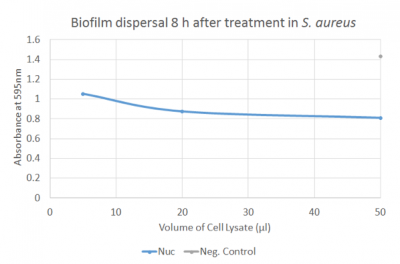 This implicates that Nuc significantly dispersed biofilm compared to the negative control. Figure 3. Absorbance measured for different volumes of Nuc using S. aureus as biofilm-producer. 1) Chen WJ1, Liao TH. Structure and function of bovine pancreatic deoxyribonuclease I. Protein Pept Lett. 2006;13(5):447-53. 2) Okshevsky M, Regina VR, Meyer RL. Extracellular DNA as a target for biofilm control. Curr Opin Biotechnol. 2015 Jun;33:73-80. 3) Izano EA1, Amarante MA, Kher WB, Kaplan JB. Differential roles of poly-N-acetylglucosamine surface polysaccharide and extracellular DNA in Staphylococcus aureus and Staphylococcus epidermidis biofilms. Appl Environ Microbiol. 2008 Jan;74(2):470-6.